New York: Tundra Books, Lower East SIde Tenement Museum, 2001. 55 pp. From the back cover: 'The Gumpertz, the Confinos, the Rogarshevskys, the Baldizzis: four of the hundreds of families whose first home in the New Wolrd was a dar, crowded tenement on New York's Lower East Side at 97 Orchard Street. Linda Granfield brings to life conditions that were familiar to millions of immigrants in many of North America's big cities. 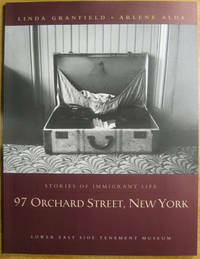 Her text and archival materials are beautifully complemented by Arlene Alda's sensitive photographs, which evoke the hardship, the dignity, and the hope encompassed on 97 Orchard Street. This book is a valuable resource for those interested in understanding our own histories in North America, and the experiences of new immigrants who came here. Linda Granfield's titles include In Flanders Field: The Story of the Poem by John McCrae, Pier 21: Gateway of Hope, and Amazing Grace: The Story of the Hymn. Arlene Alda is an award-winning photographer whose children's books include Sheep, Sheep, Sheep, Help Me Fall Asleep; Arlene Alda's 1, 2, 3; and Harry Grannie Annie.'. Illustrated Wraps. Near Fine. 4to - over 9¾" - 12" tall. Madison, WI: University of Wisconsin Press, 1982. pp. 349. Clean, newish, but for small water stain. 'For an understanding of Bossism, Reform, and Progressivism as they were known in the United States between 1890 and 1912, this book is the most illunimating as well as the most interesting work in existence. . . In the stormy period here covered many men thought with La Follette that greedy business interests were fast gaining control of the land through the servants they placed in state governments and the Senate; and with varying degrees of fervor reformers fought their way to the helm in one state after another--Dolliver and Cummins in Iowa, Bristow in Kansas, George W. Norris in Nebraska, Beveridge in Indiana, U'Renin in Oregon, Hughes in New York--to combat these interests. All of them kept their eyes on La Follette and Wisconsin as models.' . Later Printing. Trade Paperback. Very Good. 8vo - over 7¾" - 9¾" tall. New York: Christie's, New York, 2005. 311 pp. 482 lots. Many excellent illustrations in color including full page reproductions of both Alexander Wilson's and Audubon's Carolina Parrot or Parakeet. . Wraps. Very Good. 4to - over 9¾" - 12" tall. Carey, Ohio: Robert G. Hayman, 1972. 88 pp.+index. 774 items. Catalog Sticker at bottom of spine. 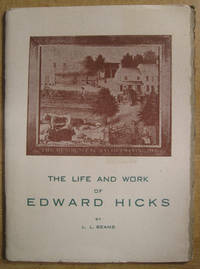 'Home of the Moonshiner' on cover. Approx. 15 b&w illus. A vintage Ohio antiquarian bookseller catalogue. There are 150 items listed in a special section entitled 'A Collection of Books, Pamphlets, and Other Printed Material Relating to American Slavery and the Black Man.' 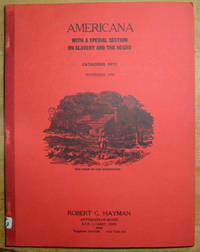 Other items include Alaska, almanacs, American revolution, bibliography and books, California, Canada, canals, cattle and cowboys, church and religion, Civil war, crime, fiction, genealogy, Great Lakes, Illinois, Indiana, Indians, Iowa, juvenile, Kentucky, Lincoln, medicine, Mexico, Michigan, Missouri, Mormon, New York, Ohio, outlaws, Pennsylvania, Pacific Northwest, poetry, railroads, rivers, slavery, songsters and music, south (war, individual states, and slavery), Southwest, sporting, Texas, Virginia, War of 1812, West Virginia, and Wisconsin.. Stapled wraps. Very Good. 4to - over 9¾" - 12" tall. New York: Sotheby's New York, 2005. 136 pp. 100 lots. 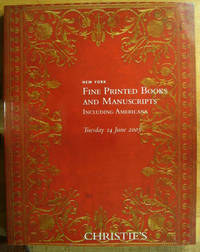 Nicely illustrated highlights include: lot 5: John James Audubon and John Bachman, Quadrupeds of North America; lot 8: A very fine example of an English cottage-roof binding, in a handsome state of preservation, for $21,600; lot 15: The earliest surviving Samuel Clemens manuscript, a four stanza poem from 1856, for $36,000; lot 17: A collection of 41 letters, signed from William F. Cody (Buffalo Bill) for $36,000; Many lots of Edward S. Curtis, including North American Indian Portfolio 1, which sold for $78,000; Lafacadio Hearn, La Cusine Creole; Charles Lutwidge Dodgson; Albert Einstein, Sigmund Freud; Galileo, Sidereus nuncius magna, longeque admirabilia spectacula pandens. Venice: Tommaso Baglioni, 1610, estimated at 250,000-350,000 apparently did not sell. Keats, Kerouac, Woolf, Lucretius, Nabokov, Newton, Pound, Wittgenstein, Wright.. Wraps. Very Good. 4to - over 9¾" - 12" tall. New Haven: William Reese Co. 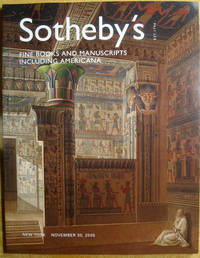 Bookseller's Catalogues nos. 231, 234 N.D., ca. 2005. 231: lists 221 items 'relating to issues of slavery and abolition in the Atlantic world in the 17th to 19th centuries. While a number of items have to do with slavery in the United States, the greater part is devoted to larger field, particularly Caribbean slavery, the slave trade, and the like.' 234: 'is devoted to maps of the Western Hemisphere, primarily of the United States in the 18th and 19th centuries. In most cases they are maps in books (such as Lewis and Clark or Pike), pocket maps, wall maps, or atlases,but in some cases manuscript. There are also a number of earlier pieces, from 1541 onward.. Illustrated Wraps. Fine. 8vo - over 7¾" - 9¾" tall. New York: Sotheby, Parke-Bernet, 1972. 147 pp. 179 Lots. About 100 illustrations, perhaps 10 in color. Including Benbridge, Cassatt, Hassam, Inness, Kensett, Neagle, Raphaelle, Rembrandt, and Rubens Peale, Stuart, Tate, Charles Hawthorne, George Henry Hall, Guy Wiggins, John Frederick Peto, John Singer Sargent, Carl Oscar Borg, William De La Montainge Cary, Gilbert Gaul, Edwin Willard Deming, Charles Craig, W. Meuttman, Albert Bierstadt, Matthias Sandor, Frank Tenney Johnson, Bert G. Phillips, Peter Rindisbacher, Henry H. Cross, Frederick A. Verner, Olaf C. Seltzer, Junius B. Stearns, Robert Salmon, Frederick J. Waugh.. Wraps. Very Good. 4to - over 9¾" - 12" tall. New York: Sotheby's, 2001. 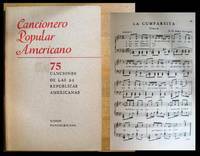 378 pp., 418 lots, Addendum, 8 pp. Some tiny imperfections, some creasing and soiling to fore edge of addendum. Includes 8 pp. 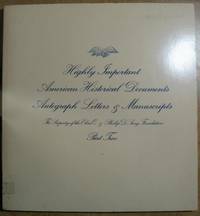 insert Addendum lot 223A, the letters of J. D. Salinger to his Daughter Peggy, estimated at $250-350,000, which did not sell. The letters are described at length with several illustrations. Some highlights: lot 60, The Works of Geoffrey Chaucer, ed. F.S. Ellis. Hammersmith: The Kelmscott Press, 8 May 1896, one of 425 copies on paper, $46,750; lot 107, Austen, Jane, Sense and Sensibility: A Novel. By a Lady. London: T. Egerton, 1811, Jerome Kern's copy, $81,250; lot 159, Hemingway, Ernest, Typescript of The Dangerous Summer, 1960, $52,500; lot 385, M'Kenney, Thomas L., and James Hall, History of the Indian Tribes of North America, 3 vols., 1837, 1842-44, $58,250; letters from Jack Kerouac to Neal Cassidy, Carl Solomon, and Lois Sorrells, nicely reproduced here.. Illustrated Wraps. Very Good. 4to - over 9¾" - 12" tall. New York: Sotheby Parke Bernet, 1980. unpag. Lots 865-1053. Square format. Small catalogue sticker at bottom of spine. Prices realized laid in. 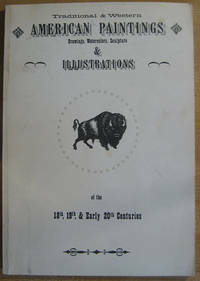 More than 70 illustrations in black and white, including John Adams, John Quincy Adams, John Alden, Benedict Arnold, Jefferson Davis, Edison, Eisenhower, Fourteenth Amendment, Robert Frost, Ulysses S. Grant, Horace Greeley, Alexander Hamilton, John Hancock, Benjamin Harrison, Thomas Jefferson, John F. Kennedy, Lyndon B. Johnson, Lafayette, Charles Lee, Robert E. Lee, Abraham Lincoln, Mary Todd Lincoln, Charles Lindberg and Richard E. Byrd, MacArthur and Hirohito, Madison, Monroe, Paul Revere, Theodore Roosevelt, George Washington, Orville Wright. A nicely presented volume with many transcriptions of unillustrated items.. Wraps. Very Good. 4to - over 9¾" - 12" tall.